Swap out your regular burger with this tasty halloumi and mushroom burger. 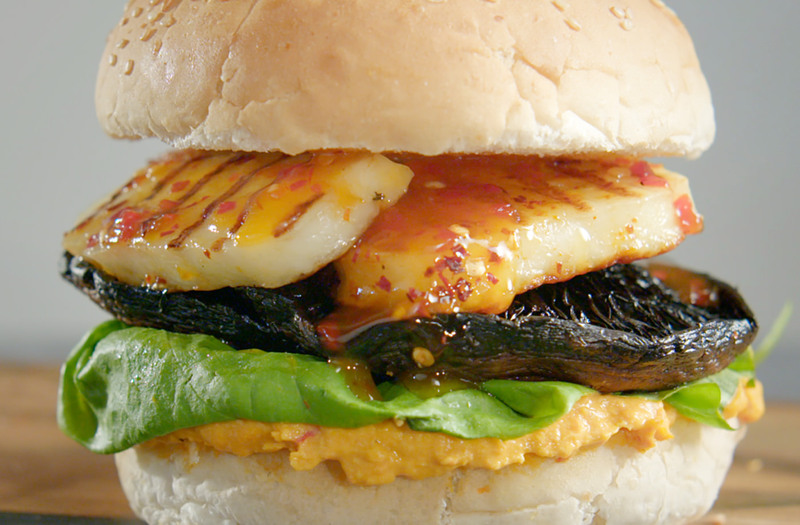 This vegetarian burger layers creamy red pepper houmous, crisp lettuce, juicy grilled mushrooms and wonderfully charred halloumi, making it both colourful and satisfying. Slice the halloumi and coat in the olive oil. Heat a large griddle pan to very high and fry the halloumi until charred lines appear, turning once, then remove and keep warm. If cooking on a barbecue, place on the hottest part and cook for 1-2 mins, turning every 30 secs, until charred lines appear. Take off and keep warm. Grill the Portobello mushrooms on both sides for 3-4 mins, or until done to your preference. Slice the buns and grill until toasted. Assemble the burgers by spreading red pepper houmous onto the bottom part of the bun, add lettuce leaves, the mushroom and the halloumi, topping with sweet chilli sauce to taste and finishing with the bun lid.